My husband absolutely loves beets. However, when it comes to cooking with them, I always feel like I prepare them the same way every time. I sometimes have a hard time thinking out of the “beet” box. While Anthony enjoys beets any way I prepare them, I like to surprise him with something different once in a while. I snapped out of my “beet” box funk the other day and prepared this delicious Roasted Beet Salad with Goat Cheese and Balsamic Vinaigrette for lunch last week. There were no left overs. None. His belly was happy and so was I. I really enjoy cooking for him because he appreciates good food. It’s almost summer here on the farm and I am so excited that our Jersey Fresh produce is starting to roll in. We grow beets in the spring and fall. Despite their rugged looking exterior, beets are sweet, healthy and full of flavor. They are high in many vitamins and minerals like potassium, magnesium, iron; vitamins A, B & C; beta-carotene, and folic acid. Did you know you can also eat the leaves to. They are great sautéed in olive oil with garlic and salt or eaten raw in a salad. Chances are if you belong to a CSA, you may get a bunch or two on your share for the week. You may even ask yourself what to do with them. For this recipe, I roasted the beets instead of boiling them. Roasting them brings out their rich, earthy flavor. I simply peeled them and placed them on a baking sheet. I drizzled them with olive oil, salt and pepper before I placed them in the oven.After I removed them from the oven, I let them cool to room temperature. I then sliced in quarters, added them in a bowl and drizzled them with the balsamic vinaigrette. On a serving dish, I added a generous helping of spring mix, sliced cherry tomatoes, goat cheese and some candied walnuts. Top the salad with the beets. Be sure to spoon some of the extra balsamic vinaigrette over the top. So tell me, what’s your verdict on beets? Are you a fan or not? If not, I bet this Roasted Beet Salad with Goat Cheese and Balsamic Vinaigrette will change your mind. 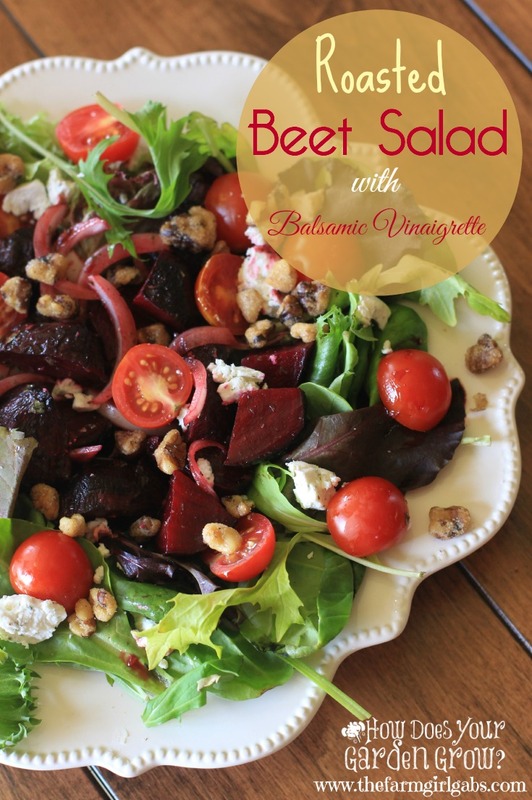 Roasted Beet Salad with Goat Cheese And Balsamic Vinaigrette is a healthy and delicious salad. Roasting the beets brings out their rich, earthy flavor. Peel the beets and place on parchment lined baking sheet. Drizzle with olive oil. Bake at 400 degrees for 35-40 minutes until fork tender. Remove from oven and let cool. When cooled, slice into quarters and place in bowl. To make vinaigrette, whisk together balsamic vinegar, garlic, basil, salt and pepper in small bowl. Gradually stir and whisk in olive oil. Place a generous helping of spring mix on a serving dish. Add goat cheese, cherry tomatoes and candied walnuts. Spoon beets and vinaigrette over salad. I love a good beet salad! Gorgeous salad and gorgeous beets Melissa! Love that you roasted them. Boy do I wish I lived closer to get some of those fresh beets. You are so clever to grow your own produce. Beautiful pictures! Have a great day! 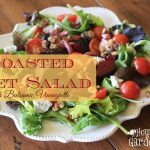 I love the combination of flavors that you included in this salad – looks like a great pairing for the beets!